2019 Winnebago Minnie Winnie 31G, Winnebago Minnie Winnie class A motor home 31G highlights: Full Wall Slide Out Bunk Beds Sleeps Eight People Spacious Bathroom There are endless possibilities with this Minnie Winnie class C gas coach. Model 31G offers you a spacious interior thanks to a full wall slide along the driver's side, 28" x 73" bunks for the kiddos, a rear bedroom, and total sleeping for eight! In the rear bedroom you will find a queen bed, chest of drawers and wardrobe. The spacious bathroom has a 32" x 32" radius shower, toilet, and sink. Whether your adventures take you near or far you will want a Winnebago Minnie Winnie class C motor home. With each model you can enjoy the time that it takes to get to your destination as well as the fun that awaits you. Inside you will find easy to clean vinyl flooring throughout, tinted windows, a USB charger near the dinette and in the bedroom, as well as a 32" HDTV with DVD player. All of your gear can easily be stowed in the large lighted trunk storage compartment. There are several optional package upgrades available to help you customize the perfect family-friendly model for you. What are you waiting for? Now is the time to choose your Minnie Winnie and let the fun begin!  2019 Winnebago Minnie Winnie 31K, Winnebago Minnie Winnie class C motor home 31K highlights: Single Slide Out Rear Bedroom Split Bathroom U-Dinette This Minnie Winnie class C gas coach by Winnebago can make all of your camping trips more enjoyable. Imagine having everything you need no matter where you stop. Model 31K offers a large slide out with a u-dinette and a sofa. Both the dinette and sofa easily convert into additional sleeping space. The split bathroom has a 26" x 30" shower along the curbside and across the hall there is a private toilet area with a sink. At night you will find comfort and relaxation in the rear bedroom. Whether your adventures take you near or far you will want a Winnebago Minnie Winnie class C motor home. With each model you can enjoy the time that it takes to get to your destination as well as the fun that awaits you. Inside you will find easy to clean vinyl flooring throughout, tinted windows, a USB charger near the dinette and in the bedroom, as well as a 32" HDTV with DVD player. All of your gear can easily be stowed in the large lighted trunk storage compartment. What are you waiting for? Now is the time to choose your Minnie Winnie and let the fun begin! 2019 Winnebago Minnie Winnie 31K, Winnebago Minnie Winnie class C motor home 31K highlights: Single Slide Out Rear Bedroom Split Bathroom U-Dinette This Minnie Winnie class C gas coach by Winnebago can make all of your camping trips more enjoyable. Imagine having everything you need no matter where you stop. Model 31K offers a large slide out with a u-dinette and a sofa. Both the dinette and sofa easily convert into additional sleeping space. In place of the sofa you may want to add the optional TrueComfort+. The split bathroom has a 26" x 30" shower along the curbside and across the hall there is a private toilet area with a sink. At night you will find comfort and relaxation in the rear bedroom. Here there is a queen bed and you can even add an optional 24" HDTV.Whether your adventures take you near or far you will want a Winnebago Minnie Winnie class C motor home. With each model you can enjoy the time that it takes to get to your destination as well as the fun that awaits you. Each unit is available with a Ford E350 or a Ford E450 chassis. Inside you will find easy to clean vinyl flooring throughout, tinted windows, a USB charger near the dinette and in the bedroom, as well as a 32" HDTV with DVD player. All of your gear can easily be stowed in the large lighted trunk storage compartment. There are several optional package upgrades available to help you customize the perfect family-friendly model for you. What are you waiting for? Now is the time to choose your Minnie Winnie and let the fun begin! 2019 Winnebago Minnie Winnie 22M, Winnebago Minnie Winnie class C motor home 22M highlights: Single Slide Out Overhead Bed U-Shaped Dinette Spacious Rear Bathroom This Minnie Winnie class C motorhome has everything you need to enjoy a great time away from home! This unit features a slide out 60" x 75" bed, and all of the basic kitchen accommodations that make cooking and dining easy right from camp. Above the cab there is a 57" x 95" bed, plus the u-dinette also converts into a 45" x 74" bed. In the rear corner bathroom you will find a 23" x 34" shower plus a toilet and a sink. Get ready to set out on new adventures with this 22M Minnie Winnie! Whether your adventures take you near or far you will want a Winnebago Minnie Winnie class C motor home. With each model you can enjoy the time that it takes to get to your destination as well as the fun that awaits you. Inside you will find easy to clean vinyl flooring throughout, tinted windows, a USB charger near the dinette and in the bedroom, as well as a 32" HDTV with DVD player. All of your gear can easily be stowed in the large lighted trunk storage compartment. There are several optional package upgrades available to help you customize the perfect family-friendly model for you. What are you waiting for? Now is the time to choose your Minnie Winnie and let the fun begin! 2019 Winnebago Minnie Winnie 22R, Winnebago Minnie Winnie class C motor home 22R highlights: U-Shaped Dinette Overhead Bed 54" x 80" Bed Rear Bathroom This Minnie Winnie Class C gas coach has everything you need to travel on a whim. Model 22R provides you with an efficient floor plan layout featuring a u-shaped dinette which can easily double as a bed for a child or guest. Above the cab there is a 57" x 95" bed and in the rear you will find a 54" x 80" bed for mom and dad. With the convenience of your own on-board bathroom you can easily get ready for any adventure that is planned for the day! Whether your adventures take you near or far you will want a Winnebago Minnie Winnie class C motor home. With each model you can enjoy the time that it takes to get to your destination as well as the fun that awaits you. Inside you will find easy to clean vinyl flooring throughout, tinted windows, a USB charger near the dinette and in the bedroom, as well as a 32" HDTV with DVD player. All of your gear can easily be stowed in the large lighted trunk storage compartment. What are you waiting for? Now is the time to choose your Minnie Winnie and let the fun begin! 2019 Winnebago Minnie Winnie 22R, Winnebago Minnie Winnie class C motor home 22R highlights: U-Shaped Dinette Overhead Bed 54" x 80" Bed Rear Bathroom This Minnie Winnie Class C gas coach has everything you need to travel on a whim. 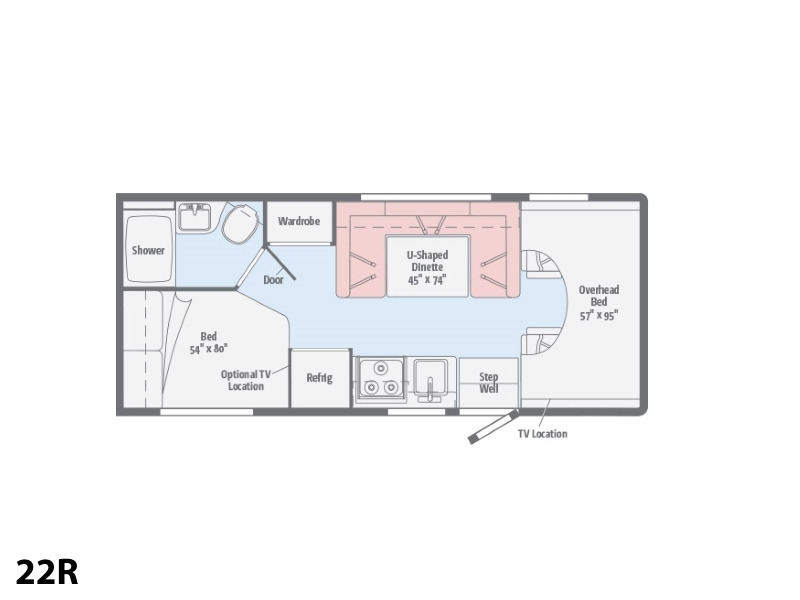 Model 22R provides you with an efficient floor plan layout featuring a u-shaped dinette which can easily double as a bed for a child or guest. Above the cab there is a 57" x 95" bed and in the rear you will find a 54" x 80" bed for mom and dad. With the convenience of your own on-board bathroom you can easily get ready for any adventure that is planned for the day! Whether your adventures take you near or far you will want a Winnebago Minnie Winnie class C motor home. With each model you can enjoy the time that it takes to get to your destination as well as the fun that awaits you. Inside you will find easy to clean vinyl flooring throughout, tinted windows, a USB charger near the dinette and in the bedroom, as well as a 32" HDTV with DVD player. All of your gear can easily be stowed in the large lighted trunk storage compartment. There are several optional package upgrades available to help you customize the perfect family-friendly model for you. What are you waiting for? Now is the time to choose your Minnie Winnie and let the fun begin!